It’s not just businesses or techy people that have their own website. 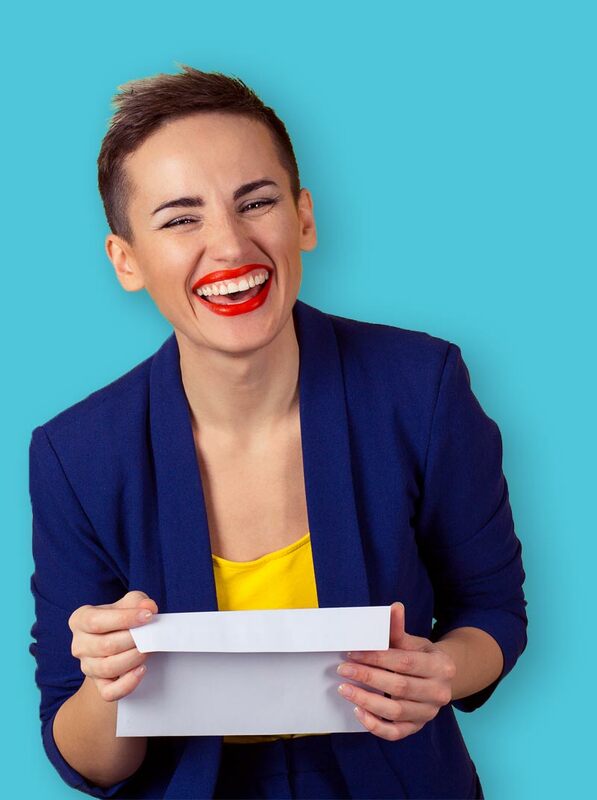 Increasingly people are starting their own website to help promote themselves and what they do. Whatever your interest, hobby or passion is, running your own website is a great way to build your personal brand – to get your message out and let as many people find out about you. One person who has set up their own website to is illustrator & best selling author Johanna Basford. She lives in rural Aberdeenshire with her husband, daughter Evie and a crazy dog called Simcoe. 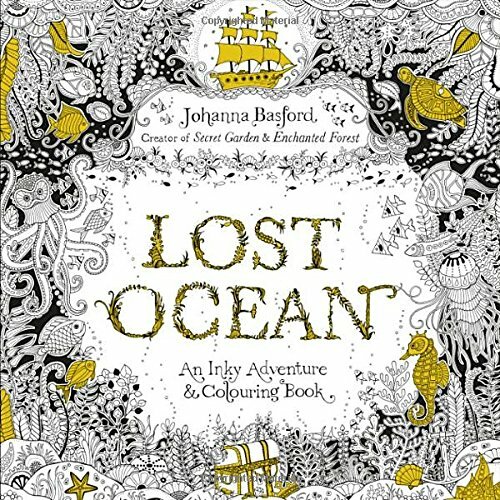 Johanna Basford was working as a commercial illustrator for major brands like Nike and Absolut Vodka and drawing to unwind when she had a brilliant idea: Why not create a coloring book, but for adults? 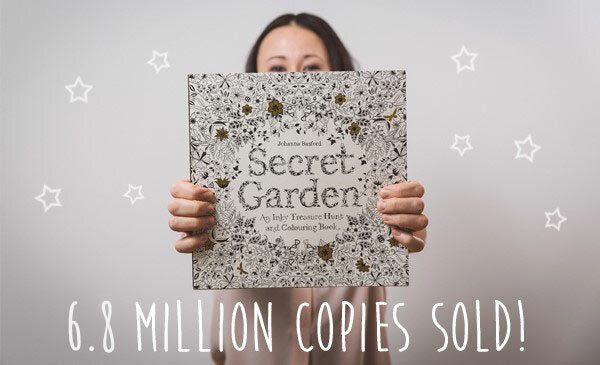 Nine months later, Basford had created her first book Secret Garden, a stunning colouring book inspired by Scotland’s Brodick Castle Gardens, where her grandfather was the head gardener. Johanna has now created three books, which have now sold over 10 million copies and have been translated into 14 languages! With her website Johanna is able to display her work and communicate with her growing fanbase via her blog and social media. Q1. What inspired your new book, Lost Ocean? After Secret Garden and Enchanted Forest, it seemed the next logical step to take my inky adventures below the waves! In some ways, I think a marine insider book was inevitable. My parents are both marine biologists and growing up my sister and I spent a lot of time on research vessels and scientific aquariums. We couldn’t eat seafood without someone leaning over your plate and doing a bit of dinner dissection! When I met my husband he was a fisherman on a Northern Atlantic trawler. He’d be away for months on end catching herring and mackerel with the rest of the Scottish fishing fleet. I’d tentatively listen to the shipping forecast in the wee small hours when I was awake drawing and wonder where he was. You could say therefore, that a book that features the sea was always on the cards. When it came to creating the artwork for the book I had a wealth of inspiration at my fingertips. My Dad has a library of marine reference books that have amazing photographs and illustrations of every known thing that lives beneath the waves. I used these and a good deal of imagination to piece together my ocean of ‘inky hybrids’ – part real and part imagined. The depths of the sea are the last great unexplored territory on earth so there’s plenty of scope for imagination when it comes to illustrating these watery worlds. I think most illustrators have a list of dream names that they aspire to work with and Penguin Random House had always featured in mine. Like most of us, I grew up with their books and so to have the opportunity to work with them this year was incredibly exciting. My daughter wakes us at about 6:30am and we have breakfast together. This usually involves Radio 4, dodging the spoonfuls of porridge that come hurtling my way and a big mug of tea. We have childcare from 8am, so I grab my laptop and get to work. I try to bookend my working day with all the digital stuff that needs done; emails, social media, website uploads etc to avoid being interrupted during the day. Our wifi signal doesn’t quite reach the attic where my studio is and I’m loathed to get a booster. I quite like that once I’ve ascended the stairs and sat down at my desk, the internet can’t get in! I spend the bulk of the day working on creative projects. This might be sketching out roughs in pencil, working on final artwork in pen and ink or preparing digital artwork for delivery to a client. I listen to radio 4 and drink copious amounts of tea whilst this is going on. I’m often completely wrapped up in the task at hand and hours can fly by without me noticing. I believe this is called being ‘in flow’ and is similar to the feeling people describe to me as a result of colouring in. At the end of the day I check-in online for another quick hour of digital work, take the dog for a walk and play with Evie before her bath and bedtime. Once she’s tucked up in bed, my husband and I eat dinner, talk about our days and sometimes squeeze in a couple of extra hours of work before bed. This might sound a bit crazy but when you love what you do and you are truly excited by the tasks on your To Do list, it’s really no hardship! Q3. Tell us about your creative process; what goes on in your studio? Q4. What’s in your toolbox? Staedtler Rotary pencils, with 0.5 HB leads, erasers, Staedtler pigment liners in 0.05 – 0.7 sized nibs, scotch tape and pads of A3 and A2 Daler Rowney layout paper. Q5. 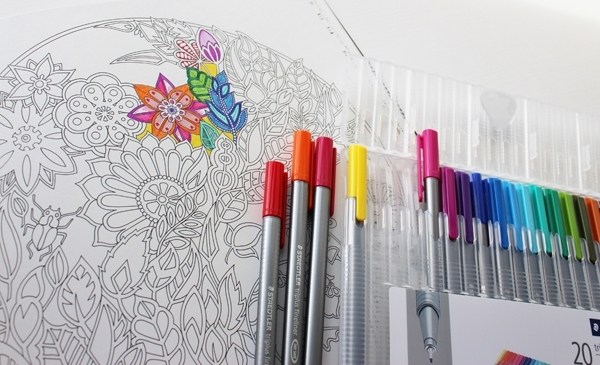 What gave you the idea for a colouring book for adults? A few years ago I created a series of illustrations which I put on my website for people to download as desktop wallpapers for free. I was working as a commercial illustrator at the time and always looking for interesting ways to increase my profile and connect with potential new clients. One of the people who downloaded my ‘Owls in a Tree’ illustration was an editor at a publishing house. She got in touch and asked if I would like to create a children’s colouring book. I pitched the idea of an adult colouring in book – my signature style of illustration was super intricate, hand drawn, black and white work and for years my clients have been telling me that they wanted to colour in my drawings. This was 4 years ago, before the worldwide trend for adult colouring kicked off, so you can imagine how quiet my editor went. They weren’t sure if colouring in for grown ups was silly and if there would be any demand for books like this. I sat in my studio and drew the first 5 pages, then emailed them to my editor. They got back to me that day and said to go for it! And with that, the inky adventure began! Q6. Why do you think so many adults are colouring in? In terms of why I think people are embracing the colouring craze, I think there’s been an underground adult colouring in movement for years, it’s just more recently that it’s come to light and become socially acceptable! I get emails from people saying until my books came out that they used to wait till the kids went to bed, then got their books out and had a sneaky colouring session! Firstly it’s a great way to de-stress. That notion of being ‘in flow’ and completely absorbed in a task – particularly an analogue task that doesn’t involve a screen – is just so soothing. Everyone’s lives are now so busy and so digital, I think colouring offers a welcome opportunity to unplug and allow yourself to be completely immersed in a task without the constant chatter of twitter or the lure of facebook. This is how I feel when I’m drawing, blissfully submerged! Secondly I think everyone has a creative spark, they just need the opportunity and encouragement to allow it to flourish. An empty sheet of paper can be daunting, but a colouring book offers a gentle buffer to those with blank canvas anxiety! I think of the books as a collaboration, I draw the outlines then the owner of the book brings the colour. They don’t need to worry about composition or layout, only colour palette. And finally, there’s the nostalgia factor. Chances are the last time most people did a spot of colouring in they didn’t have a mortgage, a mean boss or worries about the fiscal debt. Colouring gives hard working grown ups the opportunity to play and to indulge themselves in an activity which likely reminds them of more carefree days. Q7. You have now sold over 10 million adult colouring books worldwide. Have you been surprise by how well the books have sold across the world? I had no idea how the first book would be received, in fact I was quite tentative about the deal for Secret Garden and almost backed out at the last minute. It was a big risk doing something so different. We didn’t realize there would be a world wide demand for books like this, we weren’t even sure if adults would want to colour in! My ambition was always though to just create a beautiful book that I myself would love to own and colour, then hope a few other people would feel the same and buy it. It didn’t cross my mind that the books would become bestsellers in so many countries, I’m more surprised (and delighted!) than anyone! Q8. How do you feel to know that so many people around the world are now relaxing because of your art? I’m thrilled and heart warmed at how well the books have been received! I had no idea when I started out on this project if we’d sell any books or even if colouring in for grown ups would catch on. Maybe it was just a silly idea that I liked the sound of but no one else would! We didn’t realize there would be a world wide demand for books like this, so it was a huge risk. My ambition was always though to just create a beautiful book that I myself would love to own and colour, then hope a few other people would feel the same and buy it. It didn’t cross my mind that the books would become bestsellers in so many countries, I’m more surprised (and delighted!) than anyone! Q9. How has it been interacting with fans of your work? I noticed you were active on social media, and I’ve seen the coloring gallery on your website, and there appears to be a very engaged community of adult coloring fans. Is there any interaction that stands out to you in particular? The colouring community on social media is HUGE and it knows no boundaries! 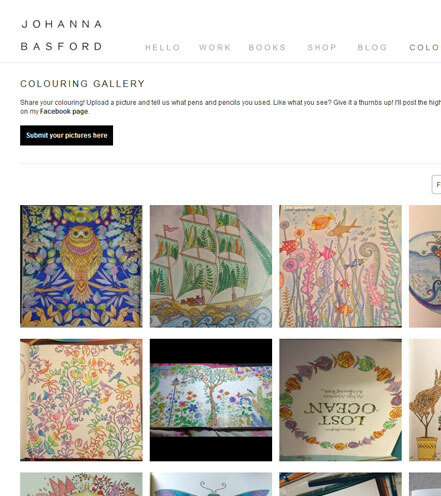 My inbox was filling up with photographs of beautiful colouring pictures faster than I could post them to my facebook page so I built a Colouring Gallery on my website where people could upload their own pictures and share details such as the types of pens and pencils they used. People just love to share their work and show off the results, and so they should! Colouring is such an open and accessible outlet for creativity, anyone can pick up and pen or pencil and create a beautiful piece of artwork. That enthusiasm and passion has just exploded online! Colouring groups both online and offline have popped up everywhere from New York to Seoul. People also send me their personal stories. They tell me where they bought their books, or who gifted them their copy. They share details of their favourite pages, suggest pens and pencils they have found work particularly well and perhaps most poignantly, some people have stories about how colouring has played a part in certain stages of their life, whether that be an investment banker distressing on his lunch break, a busy mum taking an hour to herself in the evening or a cancer patient keeping their hands busy during chemo. The stories I receive are astonishing and so touching. Q10. What inspired your first 2 books, Secret Garden and Enchanted Forest? The books take their inspiration from my childhood holidays spent on the Isle of Arran on the West Coast of Scotland. My Grandfather was the head gardener at Brodick Castle gardens there and we would visit him and my Grandmother for summer and Christmas holidays. The gardens were an amazing place for a child with a big imagination to be allowed to roam free and play. There was a formal walled garden, complete with precision planted flowers beds, honeysuckle clad pergolas and a beautiful sundial at it’s center. I have a vague recollection that there were beehives hidden in gaps in the walls, but I can’t remember if this is fact or just the imaginings of a bee curious child! Out with the walled garden lay acres and acres of forest peppered with spectacular blossoming rhododendrons, ponds with lily pads big enough to stand on, a half hidden summer house lined with pinecones and row upon row of humid greenhouses where the ‘behind the scenes’ work went on – trays and trays of seedlings, seed pods in little paper bags and mountains of plant pots! Much of the inspiration for Secret Garden came from those early days I spent playing in the Gardens and helping my Grandfather at his work. Whilst the Gardens influenced my first book, the sprawling forestry and woodlands which surround them and creep up the mountainside of Goatfell (an extinct volcano studded with crystals!) is where my second book, Enchanted Forest has its roots. The woodlands were dark, mysterious places with lots of fallen trees to climb and curious little leafy hiding places for beasts of the real or imagined variety. When my Grandfather passed away I inherited his library of botanical reference books. These are an invaluable source as they detail so many weird and wonderful species – many of which I’d never see growing here in Scotland. I often take a leaf from one plant, a petal from another and perhaps a seed pod from a third and combine them in a drawing to create an imaginative botanical hybrid. This type of fanciful horticulture ensures I always have plenty to draw! Q11. What inspires your work more generally? This is the question I get asked most often, yet it’s the trickiest to answer! I think most creative people will agree that you tend to not seek out inspiration in specific places, more that you come across dozens of little snap shots of ideas every day which you file away in your subconscious to be called upon at a later date. It’s this imaginary filing cabinet of images, lyrics, ideas, sounds and even sometimes tastes that mingle together to form inspiration. I think your natural curiosity and inclination towards certain themes do lead you down certain paths, for example I always knew I would do a book about the sea – I feel like my family history is dappled in saltwater! Also, I’ve got a very overactive imagination. I put this down to my parents’ strict ‘No TV’ rule when I was growing up. We weren’t allowed to stay indoors staring at a screen and instead were encouraged to get outdoors and play. This kind of ‘free range’ childhood; building dens, inventing monsters to slay and castles to conquer all helped to cultivate a wild sense of imagination and narrative that I think play a big part in my work. Q12. Why do you think your illustrations, in particular, appeal to adults? I think a good colouring book should contain a mini work of art on each page. A variation in pattern, motifs and panoramic illustrations keeps things interesting whilst an intricate level of detail makes sure the grown up wielding the felt tip pen or colouring pencil is adequately challenged! My illustrations are super intricate and delicate, a style which I think lends itself well to the colouring book format. Also, I work by hand; creating each illustration in pencil and pen, before scanning into the computer to edit (I don’t create on the computer) Unlike computer generated graphics which can be a bit cold and clinical, hand drawn artwork has a sense of charm and character that appeals to people. If I’m honest, I’m very selfish and create illustrations with just myself in mind! I draw to make images that I myself love to look at and want to colour, then hope that a few other people feel the same and want to buy the books. Whilst this might sound a bit inward, I think it’s a good way to work. I’m not swayed by current trends or even the lure of trying to get a commercial success, I just want to make beautiful books. I feel that as long as I remain true to those values, I’ll continue to make products that other people will (hopefully!) enjoy too. Q13. When you colour, do you stay within the lines? I’m bad! I often go out with the lines and find myself redrawing the outline to accommodate my squiggles. I like this though, I think of it as a type of colouring in freestyle. I don’t think colouring in should be a pursuit of perfection, instead it’s about having fun, learning to relax and making the images your own. Make your mark without worrying too much! Q14. Why do you prefer working with pencil and pen as opposed to digitally? I have a lot of contemporaries who produce amazing work digitally, but for me personally, I just love the imperfect circle and a slightly crooked line. I think there is something natural and soulful about the little intricacies which are evident in a hand crafted illustration. Vector artwork is so precise, almost clinical in it’s make-up, whereas something created by the human hand has character and depth (and wobbly bits!). I’ve always felt this way, perhaps in part to my inability to use a computer, but also because so much of my work is nature inspired. It seems jarring to try and capture the beauty of nature using a machine. I’m currently working on my 4th Colouring Book. It’s all unerwraps for now, but I’ll have some very exciting news to share soon! Has Johanna inspired you to show off your creative talents? Maybe she has inspired you to set up your own website? If she has, then begin by searching for the domain name you want, then get some web hosting. Then you’ll be on your way to getting your website set up. With this in mind, Easyspace has created EasySiteLive PRO – a website builder product, to help get your website up and running in no time. Click here to try our new EasySiteLive PRO website builder for 21 Days Free of charge.